In early 2015, Anchor Brewing introduced a new collection of beers to the world. Each beer was developed, tested, and brewed to be a little different than our more traditional, heritage beers like Anchor Steam® or Liberty Ale®. These limited-edition beers are meant to push our brewers’ creative boundaries and be awfully delicious, while remaining, from the beginning, a true Anchor expression. The Anchor Argonaut Collection™ debuted in the winter of 2015 with the release of Flying Cloud San Francisco Stout™. Then, in the summer months, we released Double Liberty™ IPA under this banner. And now, for the third and final Argonaut Collection brew for this year, we present Anchor Barrel Ale™. 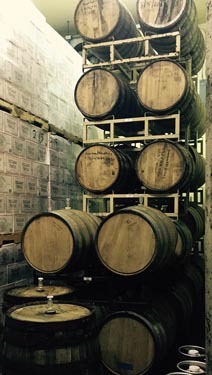 Anchor has had a barrel-aged beer in our arsenal for some time called Our Barrel Ale, or OBA, as it has come to be known. 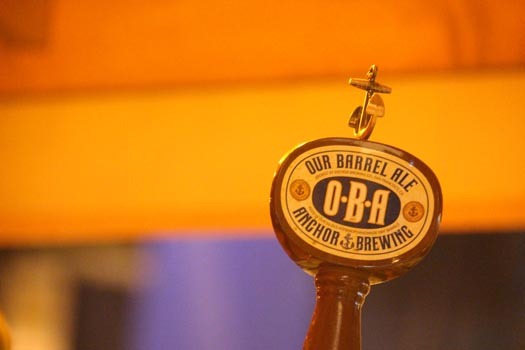 OBA is a blend of multiple Anchor brews that is aged exclusively in Anchor’s own Old Potrero® Single Malt Straight Rye Whiskey barrels. The beer has been a fan favorite at special events, beer festivals, and other occasions when brewery insiders were allocated a keg or two. The issue has always been to satisfy very high demand with the limited amount of OBA that was available. Our challenge has been that, unlike many barrel aging programs in the U.S. that source barrels from third-party distilleries and sometimes use them more than once, Our Barrel Ale is aged only in Anchor’s own whiskey barrels, which are used once. Our distillery is also relatively small compared to others, and thus, simply does not produce a high volume. As a result, the amount of barrels available to us for aging beer is quite limited. Through our experience with OBA, our brewers have found that the charred oak barrels used for aging the Straight Rye Whiskey do the best job of imparting the whiskey flavor into the beer. The blend is aged in freshly-emptied whiskey barrels for six to nine months before release. Given the demand for OBA, we wanted to take advantage of our brewers’ knowledge of barrel aging to create a barrel-aged beer that matched the quality and creativity of the Anchor Argonaut Collection, but was also brewed in a quantity that would be large enough to be distributed nationally. With Anchor Barrel Ale, we feel we’ve met both goals, and we hope your taste buds will agree. 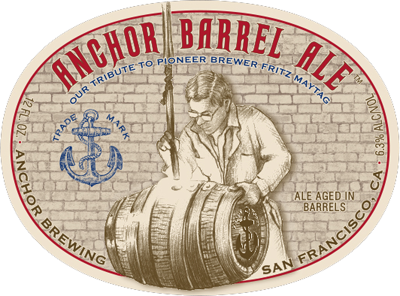 Anchor Barrel Ale is our tribute to pioneer brewer, distiller, and visionary Fritz Maytag. In 1965—at twenty-seven—he rescued America’s smallest, most traditional brewery, igniting a revolution in craft brewing that continues today. With the founding of Anchor Distilling in 1993, Fritz blazed a new trail toward the creation of craft-distilled whiskeys and gins. 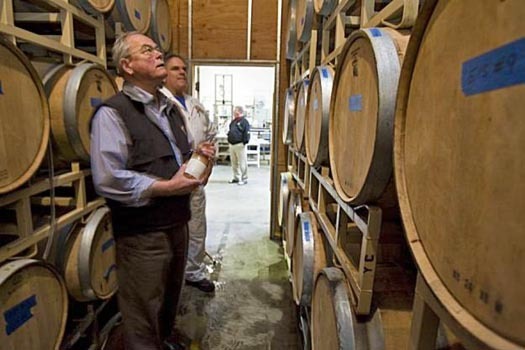 Fritz Maytag with Bruce Joseph of Anchor Distilling in 2008. Photo: sfgate.com. When we decided to make a Barrel Ale for our Argonaut Collection that was similar in character to OBA, we knew we would have to do some things differently to brew it at a much higher volume. The concept we came up with was simple: break up some barrels and age the beer on the staves. That led to the idea of hand-charring the staves on both sides, which would add a nice charred aroma without the raw wood note. Naturally, we had a charring party at the brewery. To begin the aging process, four different Anchor beers were aged separately in used Old Potrero Whiskey barrels and a quantity of bourbon barrels that were acquired to supplement our supply of whiskey barrels. Anchor Brewmaster Mark Carpenter mentions that the beers don’t undergo fermentation at this stage. 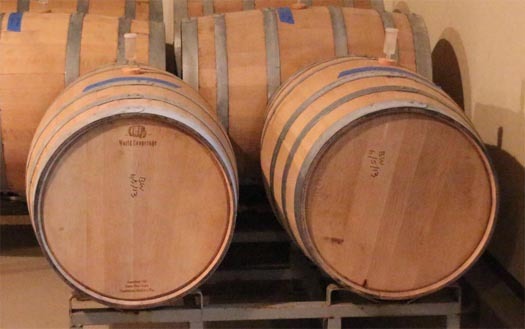 “The aging process focuses on picking up flavors and aromas from the barrels,” Mark says. Next, the aged beers are blended in a cellar tank along with the charred barrel staves for a secondary fermentation. “This allows the beer to naturally carbonate, pick up characteristics from the staves, and let the flavors marry,” Mark added. The result is a robust, malty dark beer with a slightly smoky aroma, subtle whiskey notes balanced by its coffee and toffee flavors, along with a nice smooth finish. The blend comes in at 7.5% ABV with a deep, dark brown color and just a hint of ruby red shining through. We’ve added Anchor Barrel Ale to our beer finder so you can find the nearest retailer or local establishment that has it available. While it is indeed a national release, the overall quantity won’t be out in the market for too long. With fall weather and shorter days us upon us, it sounds pretty nice to find a cozy spot, pour a glass of Anchor Barrel Ale, and settle in to Raise Your Anchor and watch the snow fly, safe and sound (and warm) from the elements. Cheers! Great beer, just what I was looking for as November turns to December in the cold Northeast. Curious to see if Anchor will brew a rye beer to go along with its fantastic rye whiskeys.